When people think of New England, they often envision pristinely painted covered bridges spanning peaceful streams, and we certainly have a pleasing assortment of those structures here in southern New Hampshire. 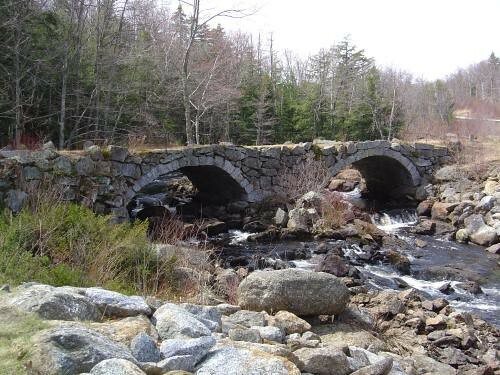 But the real architectural pride of New Hampshire is her remnant of old granite bridges, erected in the early 19th century by Scottish stone masons who eschewed mortar. That these structures have lasted over a century of New Hampshire weather with the annual cycle of freeze and thaw that sent the iconic Old Man of the Mountain tumbling from his perch is testament to the enduring strength of a well-constructed arch. 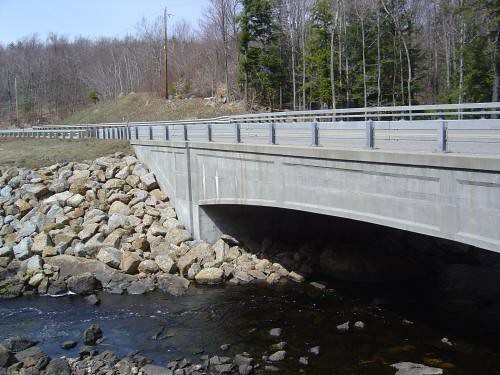 The double-arch stone bridge that spans the Contoocook River off Route 9 near the Stoddard-Antrim border is no longer open to vehicular traffic. Instead, a small parking area and historical marker encourage tourists to pull off the busy road linking Hillsborough and Keene in order to admire and take pictures. Although I wasn’t born in New Hampshire, I quickly began acting like a local when I moved here some six years ago, which is another way of saying I’d never pulled off Route 9 to admire the Stoddard bridge even though I passed it several times a week in all weathers while driving to and from work. 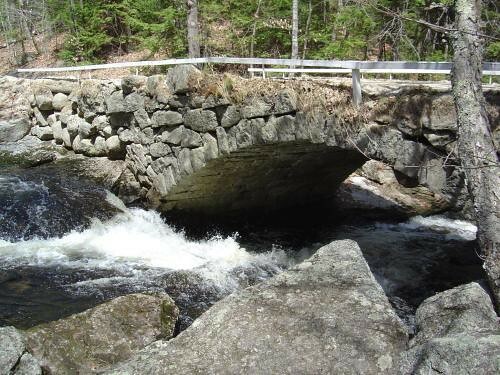 During the four years I lived in Hillsborough, NH, I often drove over several old stone bridges that are still in use, including the double arch that spans Beard Brook at Jones Road. Although those 19th century Scottish stone masons built these bridges without mortar, modern engineers have determined that that some of them can withstand the weight of motorized vehicular traffic and blacktop, a fact to which I can personally attest after having driven my pickup truck over this one-lane bridge many times during my Hillsborough days. One claim that puts Hillsborough on the historical map is the fact that it is the birthplace of Franklin Pierce, fourteenth President of the United States. Pierce’s stint in Washington was so unremarkable that he was the only incumbent President who failed to be renominated by his own party. 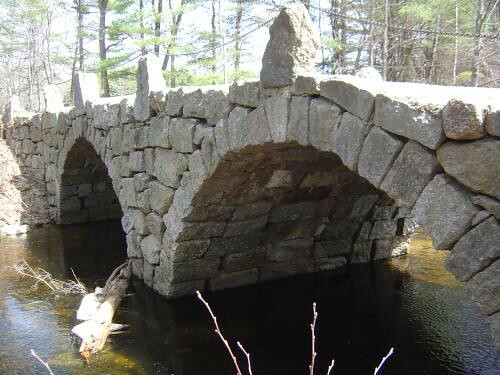 Hillsborough’s real claim to fame, I think, is her handful of still-usable stone bridges, edifices which have stood strong for much longer than Franklin Pierce’s feeble four-year tenure and still work. Not only are many of the bridges of Hillsborough County still functional, they all are scenic, being built of the same granite stuff that undergrids the entire state and blending beautifully into their surrounding landscape. 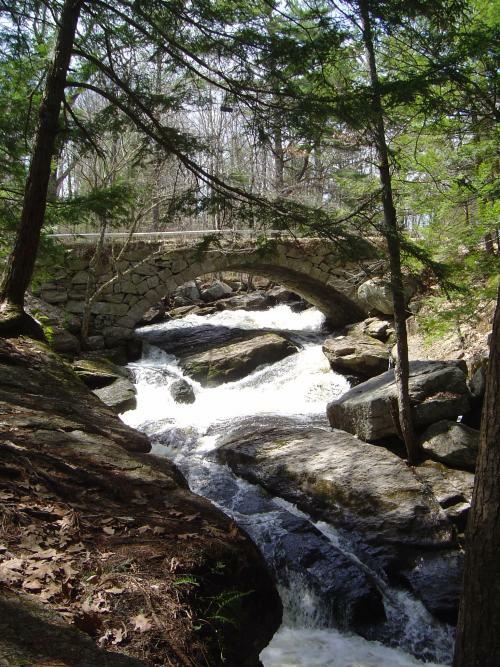 The stony jewel in Hillsborough’s crown is the single-arch bridge at Gleason Falls, a structure which transports cars over Beard Brook year-round while the tranquil shallows below the falls serve as a popular local swimming hole in the summertime. Wouldn’t you like to cool your heels within sight of this bridging beauty? 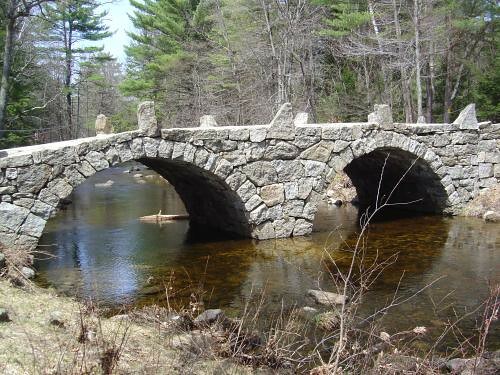 With arch-stones as meticulously crafted and set as granite vertebrae, the stone bridges of New Hampshire’s Contoocook Valley are among her hidden treasures. Made out of Mother Nature’s own bone, these old edifices seem destined to last as long as the boulders and trees that surround them, safely spanning as they do the very waters of Time. 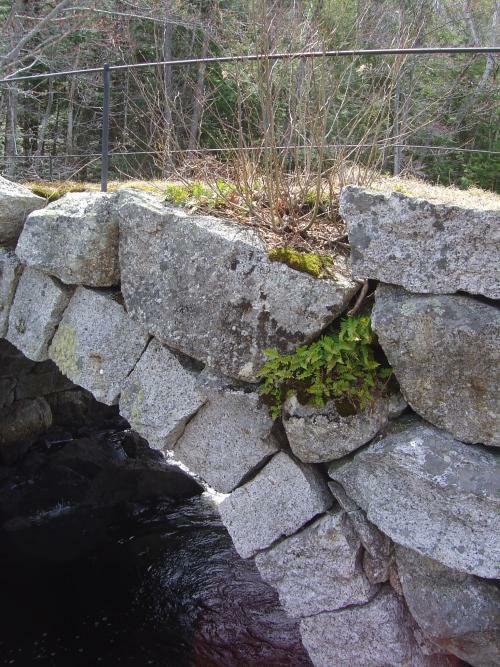 After seeing how 19th century Scottish stone masons spanned the rivers running through southern New Hampshire, you look with a more critical eye toward the modern structures that cross these same watercourses. 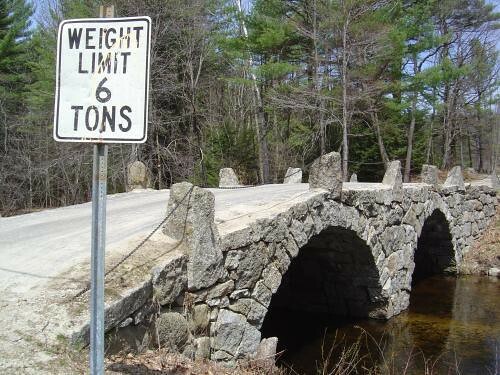 Skirted with a tumble of granite rubble, the modern-day Route 9 bridge over the Contoocook River looks stable enough, but will it pass the test of time? In 150 years, will this bridge with its modern materials and construction be as strong and beautiful to look at as the arching remnants that dot this corner of New England like stony jewels? Oh, Lorianne, these are wonderful. I’d vote for the masons no question. I kept thinking of an interchange in the BBC show Oliver’s Travels when our heroine says her father is a mason, and Oliver asks if he will need to know a secret handshake. She laughs. “Is he big?” asks Oliver. Wow, what beautiful bridges and beautiful rivers. That’s architecture in harmony with nature. If you blanked the bridges out of those photos you wouldn’t know there was anything amiss, judging by the surroundings. Modern bridges are not only ugly the mess up quite a bit of river as well. Ugh. What lovely works of art these bridges are! Your photos are pretty spectacular too. Thanks for sharing these. Wow! When I looked at these photos I honestly could have believed I was looking at pictures of home (Inverness-shire, Highlands of Scotland). I was interested to see you’d written that Scottish stonemasons made them – no wonder they looked so familiar to me. Particularly the first photo in this post – I swear, I could be at home. This photo here – http://www.george-jean.connectfree.co.uk/Scotlandtandem2001/day5/Carrbridge%204-pp.JPG – fits in well with your series, don’t you think? It’s in Carrbridge, Inverness-shire, very near where I’m from. Great website and pictures! You are doing what I am trying to do, tell a story of New England. But, I have a whole lot less text! I have you blogmarked and will be back often to check out your site. Good Job. Your photo essay on stone bridges is very impressive. You have a way of combining a very descriptive narrative, interesting images, and history that makes your posts well worth a regular visit. I love New England and visited there many times in the past. I started collecting American and English pewter in Newfield, Maine. The hue of the stones in your photos reminds me of why I love pewter. Thanks for the trip! Great photos and wonderful narrative. I learned a lot from this post. I had no idea about any of this. I love your site. As for your question regarding whether the modern bridges will stand the test of time, all I can say is, there’s a reason we have the expression “in the olden days, they built things to last”. The pyramids have stood for thousands of years, and I doubt we could build something like that today, even if we wanted. And modern churches, will they last as long as the great Cathedrals of Europe? Joan, what a great snippet of dialogue: “monumental” perfectly describes a stone mason’s work! Sylvia, you hit it on the head when you said these bridges are in *harmony* with nature. They’re obviously crafted & artful, but they don’t look artificial. After all these years, they’ve become part of the landscape, like a wrecked ship that’s been covered with coral. Croila, thanks for the link: that stone arch is incredible! It makes sense that the Scottish stone masons who ended up in the State would have brought their craft here with them. Personally, I’m glad they did! Carol, there’s actually a pewter workshop in Hillsborough, not far from where I took these photos. So maybe the connection between granite & pewter is deeper than we thought!